I’m always looking for the best headphones to run with, so when I came across the Aftershokz Sport Headphones, I needed to check them out. Rather than going in-ear like most sport headphones, the Aftershokz Sports go in front of the ears and use patent pending military special ops bone conduction technology to give a completely different listening experience. By having the Aftershokz in front of the ears rather than in, the sound is not of the highest quality, or as my friend Stuart put it, he felt it was like listening underwater. Since fidelity is not the top priority when exercising, this is easily overlooked when running. By not covering the ears, it makes it much easier to hear all the sounds around you, from people to vehicles. All the outside noises also affect the Aftershokz less because they aren’t overpowering the sounds going into the ears. The Aftershokz are held in place by a plastic band that hooks over the ears and goes behind the head. They are actually very comfortable and do not move when running. I never had to adjust the headphones at all while out running and only removed them when done or when people tried to talk to me. 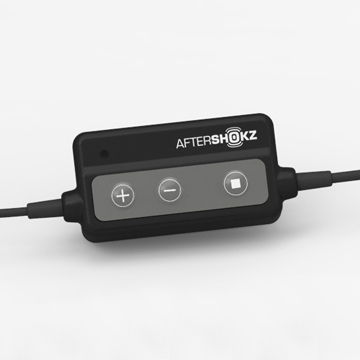 The Aftershokz are powered headphones that have a clip on remote that contain the battery and controls. My one complaint with the headphones are this battery pack. The cable length from the pack to the headphones are long enough to reach an arm band, but I have an iPod Nano I clip to my pocket, so I am forced to clip the pack to the neck of my shirt. On the pack is three buttons, power, volume up, and volume down. These controls only affect the headphones themselves, but the Aftershokz have a lower volume in general, so the headphones need to be turn up to the max all the time and the iPod turned up louder than with other headphones. I would have preferred to have the buttons control the iPod than the headphones, but these issues are my only real complaints about the Aftershokz. Even with my problems with the battery pack, the Aftershokz have easily become my favorite running headphones. They have become my go-to headphones not just for running but for listening to podcasts on the go. 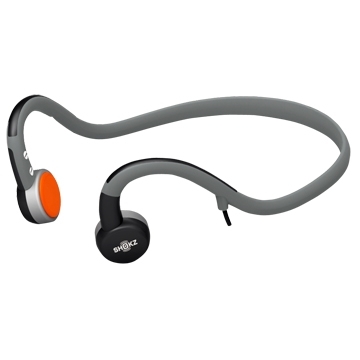 The Aftershokz Sport Headphones are everything I could want out of headphones to exercise with.